Jun. 8, 2010 · 3:07 p.m.
Jun. 5, 2010 · 8:16 a.m. The Willow Run School Board appointed a new, yet familiar trustee to the board of education during their regular meeting Thursday night. May. 27, 2010 · 2:09 p.m. The Willow Run School District signed on to a countywide consolidated transportation plan at their regular board meeting last week. May. 26, 2010 · 7:49 p.m.
May. 26, 2010 · 12:26 a.m. The Ypsilanti Public Schools Board of Education voted Monday night to repost its superintendent spot, which was not filled after a stalemate by the board after the last process. Jun. 2, 2009 · 10:54 a.m. 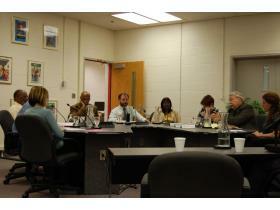 The Ypsilanti School Board voted 6-1 to repost its open superintendent position Monday night at a special meeting. Last month, the board came to a stalemate on the choice of superintendent. Neither finalist, Richard Weigel, assistant superintendent of Ypsilanti Public Schools or Dr. Theresa Saunders, superintendent of East St. Louis District 189, were able to garner enough support to be named to the position. A number of options surfaced as to how continue with the search process. One option the board considered was appointing an interim superintendent and reposting the position at some point in the future. Several board members initially supported this idea. Trustee Andrew Fanta, the only board member who voted against reposting, indicated that he’d like to see an interim superintendent brought in. Trustee Kira Berman mentioned that she thought the community had been growing impatient with the board. “I can certainly understand why,” she said. Berman added that she felt the district would see leadership faster if they chose to appoint an interim and repost the search later, however, she ultimately sided with reposting. Superintendent Dr. James Hawkins, who agreed to continue in the position until the end of the summer, told the board that reposting quickly was the best course of action. “You need permanency, you need stability, you need someone with a vested interest,” he added. Ultimately, a majority of the board sided with Hawkins. Trustee Sarah Devaney expressed concern that the method for going through another round of superintendent candidates needed to be improved. Members of the audience also voiced their opinion on how the board should move forward. Amy Doyle, who has two children in Ypsilanti schools, told the board that the district would lose time if it hired another interim. She also expressed dismay that the board was not able to come to a consensus after the first round of candidates. Keith Reed, of the Ypsilanti Support Services Association, suggested that the board consider hiring Weigel on an interim basis, and then possibly move him into the position, permanently. “He does have stock and ownership in the district,” Reed said. Dr. Michael Emlaw, of the Michigan Association of School Boards, the firm hired to assist with the superintendent search, said the board should be able to quickly repost the position and get started on the process. Despite the fact that no candidate was chosen the first time, the MASB will continue to assist the district with its search and at no extra charge. “We’re committed to you in crossing the finish line,” Emlaw said. The board plans to setup a retreat to further discuss how they’d like to continue the search process a second time around. Initial plans call for a new superintendent to be in place by September 1.